From the practical point of view, this paper refers to an educational software developed as a technological tool for understanding the logic circuits operation. Using such an interactive designer software, we have the main advantage and the opportunity of removing all the possible design errors even before proceeding to the expensive component manufacturing and assembly. From the educational point of view, our application, Logic Circuit Designer, is aimed to help both those students and users, studying computer architecture or more specifically, digital logic circuits. This product is a simulator for logic circuits, allowing the student to better visualize and understand how a logic circuit works, by enabling him to build whatever logic circuit he wants, and visually simulate its operation. Based on a friendly user interface, the student can interact with its logic circuit, flip switches, change the input data, and watch the output data changes for sequential models. 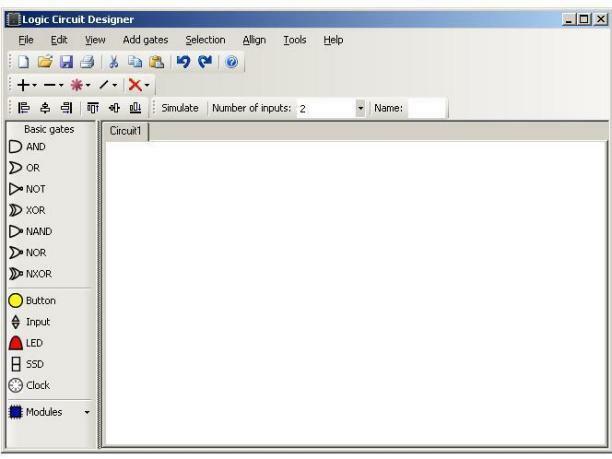 We are sure that this tool will be of great help to any student who has interest in this field, and enable him to better understand the logic circuit design process. In version 1.5, the user can arrange the wires in whichever way he wants, the gates can be rotated, every gate can have a description showing what its purpose is, module functionality simplified, a rectangle that can select many gates and wires at once, a settings window has been created, now help is included.